Judging by the amount of times I’ve seen this disc, this one must have sold well. 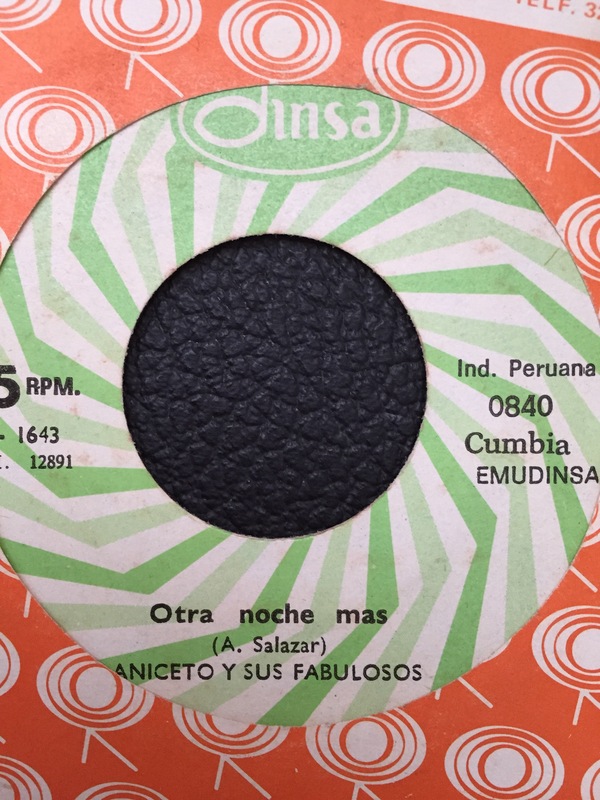 The A side is a nice upbeat cumbia with some arpeggios and a little stop-and-go rhythmic work to really profile Aniceto’s adept playing. The staccato intro of the B side gives way to some fuzzed out climbing percussion-underscored riff that, to these ears, is very enjoyable. Things get better at the outro when Aniceto gives us one of his better recorded guitar freakouts, and I’m only saddened that this fades out as soon as it does as you can tell he was really letting loose. Yet again, I find myself returning to the B side more often than Otra Noche Mas. This disc is not too hard to find and is definitely recommended for the great B side (A side is not bad, just not outstanding).